Although White Pine is the quintessential New England pine tree, Southern New England lies well within the natural range of Pitch Pine (Pinus rigida). This tree is most often associated with relatively frequent fire and serotinous cones (covered in natural resins that must be melted by fire to release seeds). Therefore, I expect Pitch Pine to occur on sites or physical settings with the capability to experience periodic fires. I have visited a number of such places in the northeastern US, including NJ, Maine, New Hampshire, and Massachusetts. 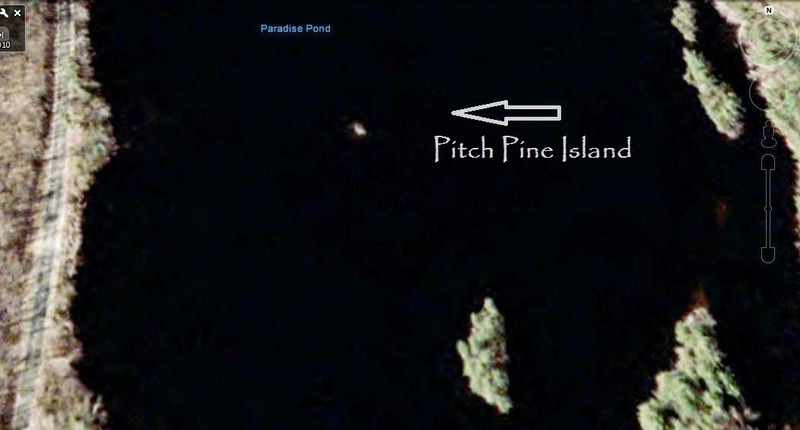 I recently noticed an unusual Pitch Pine forest on a tiny island completely surrounded by water. Known as Paradise Pond this small site in central Massachusetts was the last place I expected to see these trees. Obviously, the context and size would make it extremely unlikely this stand of trees would have ever experienced "natural" fire. A field inspection and specialized transportation were clearly necessary; a fully restored, antique Morris canoe filled the bill perfectly (thanks Jane McFadden!). Various size classes of pines were present, many with branches draping over the water. The understory vegetation, thickest around the lower edges, included northern bayberry, Sweet Gale, Sweet Pepperbush, maleberry, and the usual edible fruit bearing Ericaceuous shrubs. Cowwheat (Melampyrum lineare) may be the most common herbaceous plant. Due to an ongoing rainstorm and a hastier than planned departure, I didn't pay close enough attention to the majority of the pine cones, but many were clearly open and appeared to lack well developed serotiny. Later, a cursory literature search revealed that other sites in Massachusetts (on rocky knobs) lack serotiny (1). In addition, fire frequency has been shown to be a local determinant of serotiny with less frequently burned sites tending toward less or even absent serotiny (2). 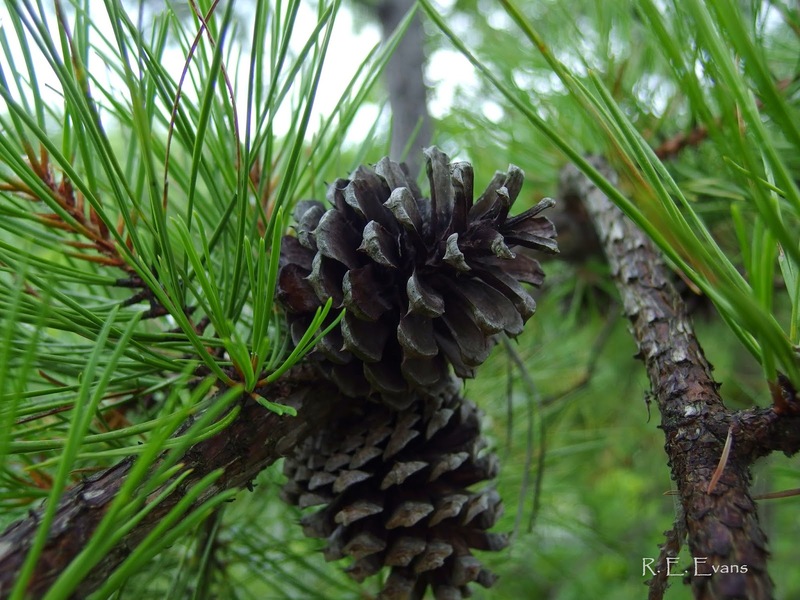 The near impossibility of fire on "Pitch Pine Island", could therefore help explain the non-serotinous cones I noted. As noted earlier, the interior of the island was almost completely dominated by Pitch Pine of various sizes (see image below). With no signs of lightning or prescribed fire (I called the "managing agency" responsible for this stand to ask about the trees - they said they were probably spruce!) it is unclear why other species are not entering the midstory or canopy. I have seen many other sites where White Pine or hardwoods have become dense and begin to compete with Pinus rigida for growing space with inadequate fire regimes. Interior view of "Pitch Pine Island"
A cursory look around the dense forests in the vicinity revealed only White Pines (and a lone, relict Pitch Pine on a nearby island). How did these pines get to the island?? Perhaps a topic for future research!